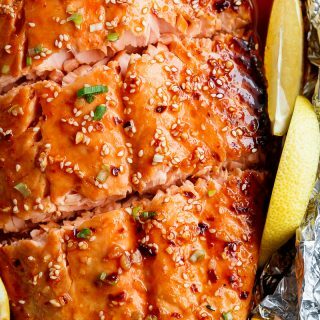 Honey Sesame Salmon In Foil is ready in under 20 minutes! Full of Asian flavours with ingredients you have in your kitchen, and so easy to pull together! 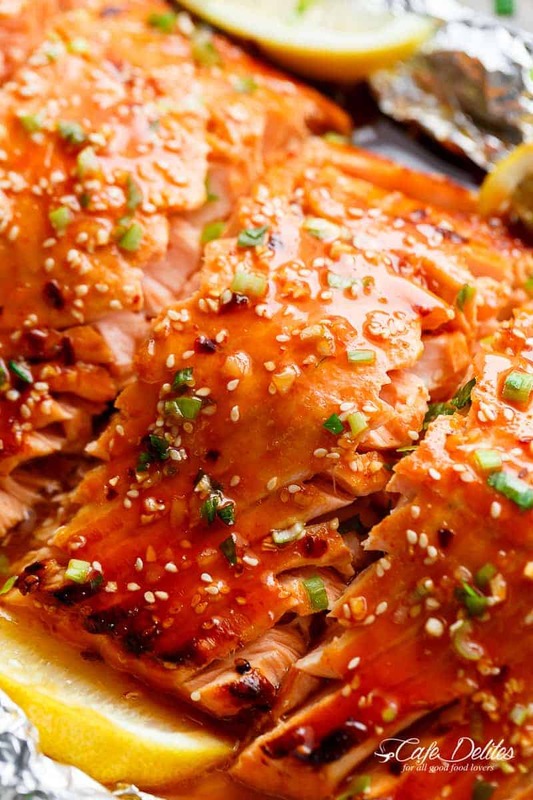 If you love Honey Sesame Chicken, you will LOVE this salmon twist! 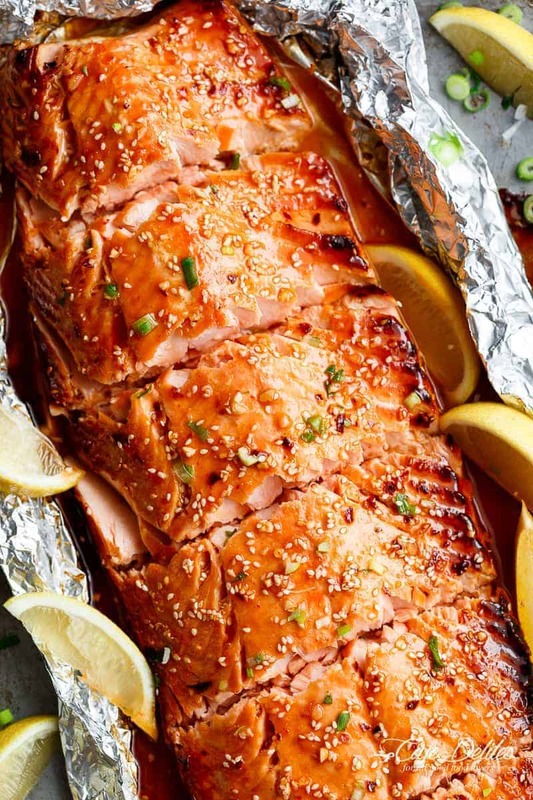 The best part about this Honey Sesame Salmon In Foil, aside from the flavour explosion? MINIMAL CLEAN UP! Hooray for less dishes! 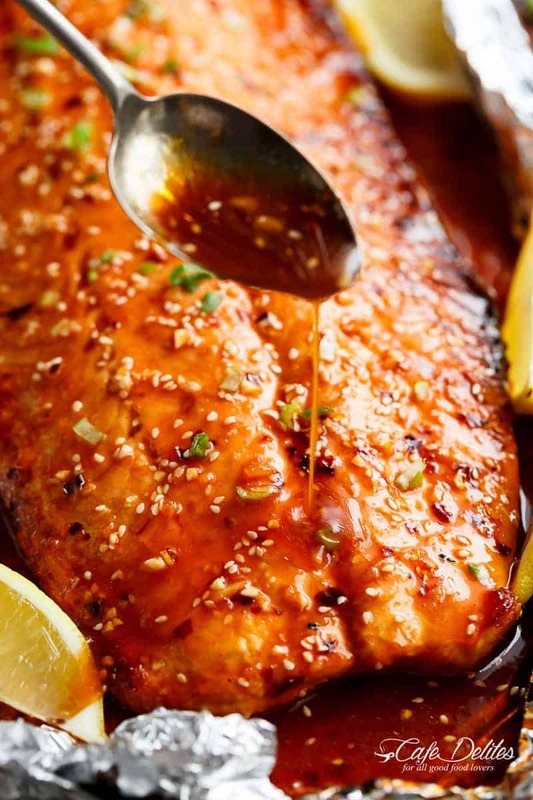 If honey and garlic butter aren’t enough of a power pairing, I mixed both of those together along with beautiful Asian sesame flavours, and created the best honey sesame sauce thats gets baked all over this salmon! 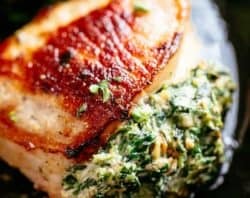 The juices of the salmon soak into the sauce to create one of the best salmon recipes I have on Cafe Delites! Super juicy and tender, the salmon falls apart on its own. Is there anything better?! NO! First, you’re going to start by making the best Garlic Butter / Honey Sesame fusion you’ve ever tasted. Reserve 1/4 cup of it for later, and pour the rest of it all over your salmon. I use wild caught because it’s healthier and safer to eat. I’d love to encourage you to do the same. The flavour is unbeatable when compared to farmed salmon. 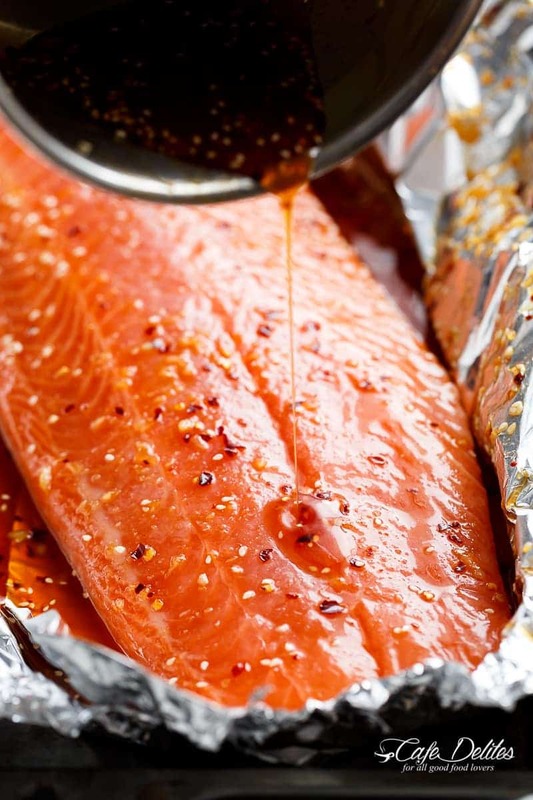 Salmon is baked in it’s own foil packet, and broiled to caramelise, char and crisp the edges. Then you are going to pour the remaining sauce over it, and behold the flavour bomb that’s about to take place. I use regular soy sauce to add much needed saltiness to the sauce. 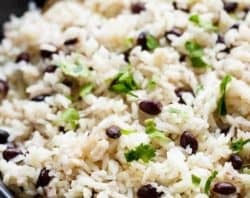 You can use low sodium soy sauce if you wish, or replace it all together with coconut animos. If using regular soy, be careful not to go over board when seasoning your salmon. If you don’t have access to rice wine vinegar, you can use apple cider or regular white vinegar as alternatives — or leave it out. Keep your eyes on the oven while your salmon is broiling. If your broiler is set too high, or if the salmon is placed too close to the broiler, the foil will burn. In a small saucepan, combine the honey, soy sauce and butter over low-medium heat, and whisk until the honey has melted through the butter and the mixture is well combined. 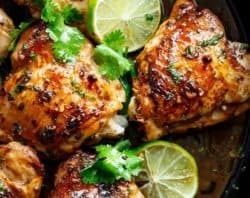 Take off the heat, and add in the lemon juice, garlic, vinegar, Sriracha, sesame oil, ginger, sesame seeds and chili flakes. Transfer 1/4 cup of sauce into a small dish for serving later; set it aside. Place the salmon onto prepared baking tray | sheet and season with salt (about 1 teaspoon -- adjust to your taste). Pour the honey sesame mixture (from the pan) over the salmon, and spread evenly with the back of a spoon or spatula to evenly cover in sauce. Fold the sides of the foil over the salmon to cover and completely seal the packet closed to prevent the sauce from leaking. Bake until cooked through (about 12-15 minutes, depending on the thickness of your fish and your preference of doneness). Open the foil, being careful of any escaping steam, and grill / broil under the grill / broiler for 3-5 minutes on medium heat to caramelise the top (keep your eye on it so it doesn't burn). Pour the reserved sauce over the salmon and garnish with green onion slices. Serve immediately with lemon wedges. If you don't have access to rice wine vinegar, you can use apple cider or regular white vinegar as alternatives -- or leave it out. Keep your eyes on the oven while your salmon is broiling. If your broiler is set too high, or if the salmon is placed too close to the broiler, the foil will burn. Please BE CAREFUL. This was absolutely delicious. I followed the recipe exactly- the heat was VERY subtle so next time I will double the Sriracha. I baked on the low end 12 mins and added an extra 2mins of broil, basting a couple times. Amazing!! OH no! I am so sorry! I am not sure what would have gone wrong! I hope they tasted great for you! 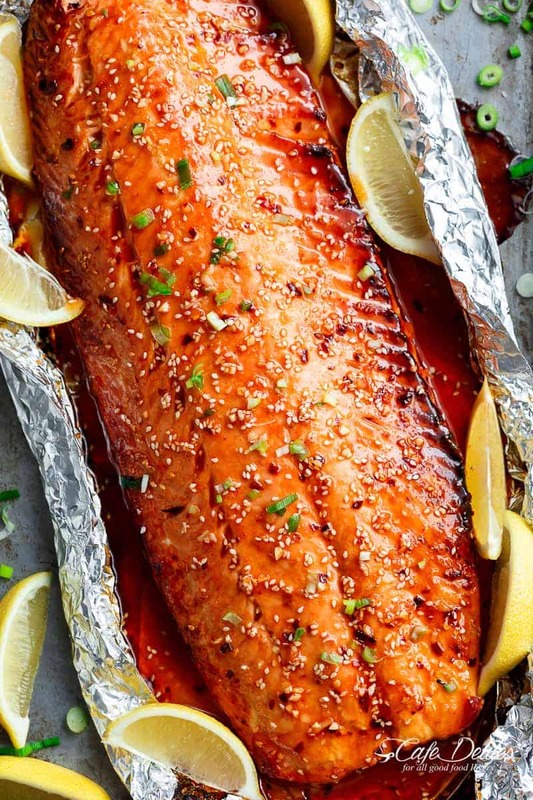 I want to try these salmon in foil dishes and freeze for my daughter in university to use throughout the week. Any thoughts of freezing them? I haven’t tried freezing them but you are welcome to try it for her. That sounds like a great idea! She will love having the ready to go meals. 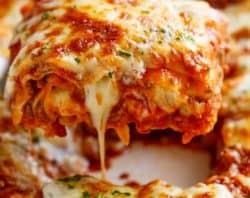 Wonderful recipe. 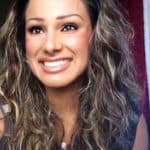 Thank you sooo much for sharing it. Your recipe travelled to Québec, Canada. Merci beaucoup ! 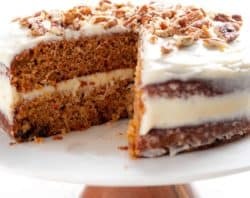 Oh my goodness, this recipe looks BEYOND amazing, and so simple too! Just a question: Can I bake this on a grill? If so, how long would you reckon it takes? 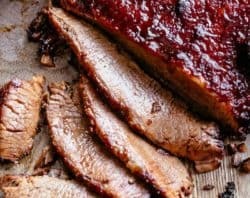 Thank you so much for your help and this DOPE RECIPE! I love that you say to cut down on the Siracha if you don’t want it too hot, I will try this and not even add the pepper flakes, my tongue does not like heat. That said, it looks great! I made the honey garlic butter with lemon salmon in foil, it was fantastic! My family loved it. I can’t wait to try the honey garlic sesame salmon. Thank you for such great ideas! This salmon looks delicious. I love your fusions and I LOVE honey sesame chicken. Having this for dinner tonight, going to the store right now. THANK YOU. I don’t have a baking oven. Is microwave oven an option? Thanks..